We carry various pool filters for in-ground and above-ground swimming pools. Total Tech Pools can find the right filter for your pool, give us a call today. Our unique blow-molded process creates a one piece, non-corrosive tank of unequaled strength and durability. 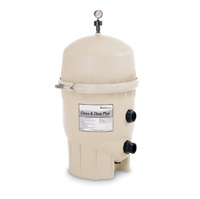 Clean & Clear® Plus Cartridge Filters have a corrosion resistant injection molded filter tank featuring superior strength and reliability. Two Models available 19″ (48,3 cm), and 25″ (63,5 cm) models. Our process creates a one-piece, fiberglass reinforced tank with superior strength and durability.